The Architects where Mr Flockton & Son of Sheffield. The foundation stone was laid on May 29th 1856. Mr. Henry Wilson, of Westbrook, paid for St. Stephen’s Church to be built with the exception of a grant of £600 from the Ecclesiastical Commissioners and then afterwards enlarged. He endowed St. Stephen’s Church with £276 per annum and purchased a vicarage house, besides investing £200 as a Repair Fund. The cost of the building was between £4,000 and £5,000. The total amount expended, including site, building, and endowment, was nearly £10,000. The building was fast nearing completion on 13th December 1857, it was opened under license of the Archbishop of York for divine service, the Rev. Dr Sale, vicar of Sheffield, preaching the sermon in the morning. The church contained sitting for 600 people. July 8th 1858 St. Stephen’s was consecrated by the Archbishop of York, Dr. Musgrave. Within ten years (1865) the congregation had grown so large that the church seating needed to expand, they added the balcony to seat extre 125 to take the totle upto 725. 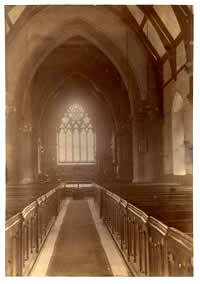 In 1902 electric light was introduced into the church. Thus it is now fifty years since the work of the Church was commenced, and during the whole of that time “The good hand of our God has been upon us.” The population has doubled, the character of the Parish has very largely changed, but still the work goes on. In order to shew our gratitude to Almighty God, and to commemorate the Jubilee of our Church, a new Church Room is bein built in the Churchyard, for use as a Vestry on Sundays, and for other purposes on Weekdays, and the Organ is to be re-built. Taken from St. Stephen’s Church Jubilee 1857 – 1907 book. 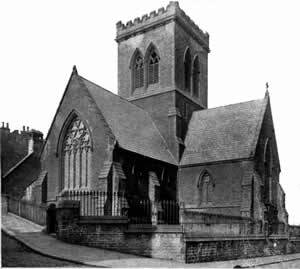 In 1940 the church close, and reopened about 1957 as a community centre as (St. Stephen’s House) Then reopened in 1964 as the Church of the United Benefice of St. Stephen’s with St. Philip and St. Anne. 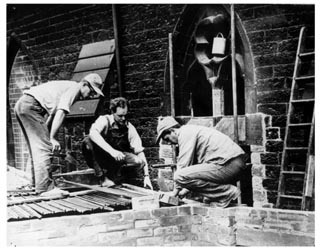 When the church was about 100 years old the congregation had declined dramatically and the need arose for a smaller worship area, so a wall was built across the centre of the building, there by creating a smaller worship area with seating for about 100 on one side and a church hall on the other. We also have documentation that tells us that in the late sixties and early seventies the building was condemned as being uninhabitable, due to damp and lack of heating, but a few faithful people kept on praying within the building, and God honoured their faithfulness. The congregation grew and people with the necessary skills arrived and gradually the church was put to rights. As to the present, the whole area of Netherthorpe has changed with the demolition of some of the flats and maisonettes, others being modernised and the building of conventional housing near the church, which now leaves the area with a population of approx. 5,000. In 2003, the church underwent a major reordering to allow us to better fulfill our aim to be ‘a home and a blessing with Jesus at the Centre’. In July 2013, the parishes of St Stephens, Netherthorpe and St Bartholomew’s, Primarose Hill, were combined together to form The Vine Sheffield. St. Bartholomew’s Parish was formed by an Order in Council dated 22 March 1879. There was no church building at the time so the first service was held in the Police Drill Room in Burgoyne Road on 11 January 1880. The Drill Room in the police station, which was located just below the site for the church, soon became too small and a new Mission Room was made by adapting two small cottages at the corner of Whitehouse Lane and Burgoyne Road and the first service was held on Trinity Sunday, 23 May 1880. 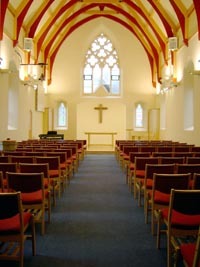 The room was also used for Sunday School and other parish activities and could seat 200 people. During 1881 the Sheffield Church Extension Society erected the Church of St. Bartholomew at a cost, including the site and the organ built by Brindley and Foster, of about £15,000, which at today’s value wold be in excess of £1.5million. The Church had seating for 640 people and was consecrated by Archbishop Thomson of York on 6 February 1882 in the presence of a large congregation, and the collection raised £17 10d. In 1890, Mrs. Blakeney (wife of the Archdeacon) laid the foundation stone of the Sunday School (latterly always referred to as the Church Hall). This was a two-storey building adjoining the Church and cost £1,853. On the 30th anniversary of the consecration of the Church, Dr. Cosmos Lang, Archbishop of York and later to become Archbishop of Canterbury, preached at the Evening Service to, at the time, was the largest congregation in the history of the Church. The Mission Hall, opened in 1880, became too small and in 1908 it was replaced by a Mission Hall on Penistone Road and this was used for Sunday worship until it was demolished in the late 1960s as part of the City Council’s Slum Clearance programme. It was noted in a parish magazine that when the fifth Vicar was appointed in 1929 that during the previous 47 years there had only been four Vicars and at least 17 Curates. Another interesting fact, again taken from a parish magazine, was that in 1934 the attendance for the year were, at Holy Communion, 1,555, and, at other services, 14,097, and the number of choir members, 30, and bible class members, 150. 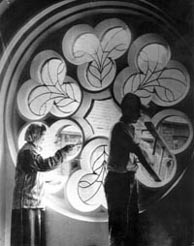 After the air raids of December 1940 the Church baptistry and Hall were used as a temporary furniture store for the period that people who were homeless as a result of the bombing. The Mothers’ Union used the Hall to prepare food for their mobile canteens. The Vicar, Rev. C. W. Scott left in 1941 to become an Army Chaplain. The Parish continued until 1977 when, by an Order in Council, the Parishes of St. Stephen and St. Bartholomew were united to form a new Parish of Netherthorpe and, in 1991, the Parish of St. Nathanael was abolished and included in the Parish. The Parish of Netherthorpe was dissolved on 1st July 1993 when St. Stephen’s and St. Bartholomew’s again became separate parishes. 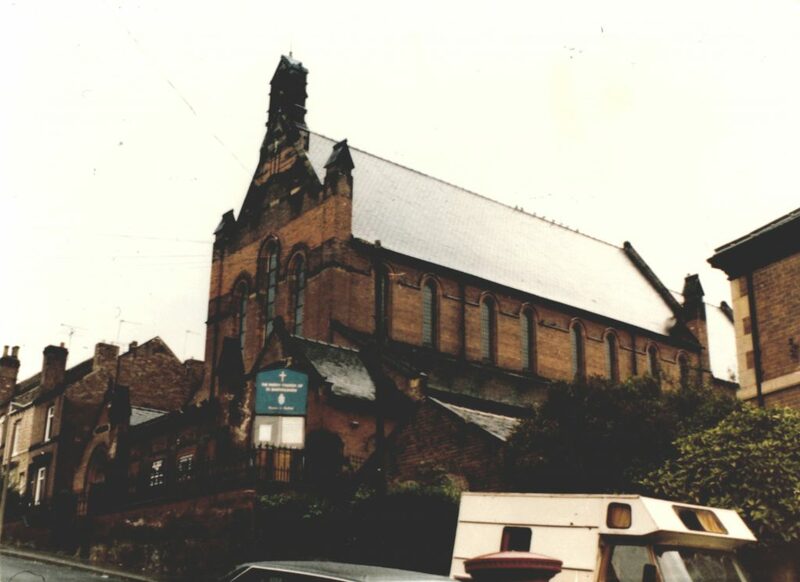 Whilst the Parish of Netherthorpe was in existence, after many discussions, it was decided to demolish St. Bartholomew’s Church and Hall and replace them with a new building. The last service was held on 26 November 1988 and demolition started on 5 December 1988. 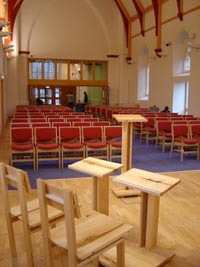 Church services were held in the Kelvin Community Centre until the new building was ready. On 1 December 1990, Bishop David dedicated St. Bartholomew’s Church Centre. The cost of the new building, including demolition and furnishings, was some £900,000. The Shiloh United Church of Christ had worshipped in the Church and continued to worship in the Church Centre until they went into their own building. On 11 January 1996 the Church Commissioners approved an Area in the Church Centre, known as the Meeting Place / Worship Area as suitable to be a Parish Church. In 1998 a small part of St. Mary’s Walkley was added to St. Bartholomew’s Parish. In July 2013 the Parishes of St. Stephen and St. Bartholomew were combined to form The Vine Sheffield. The above information has been obtained from official documents and parish minutes and newsletters.